Often simple preparations are the best. 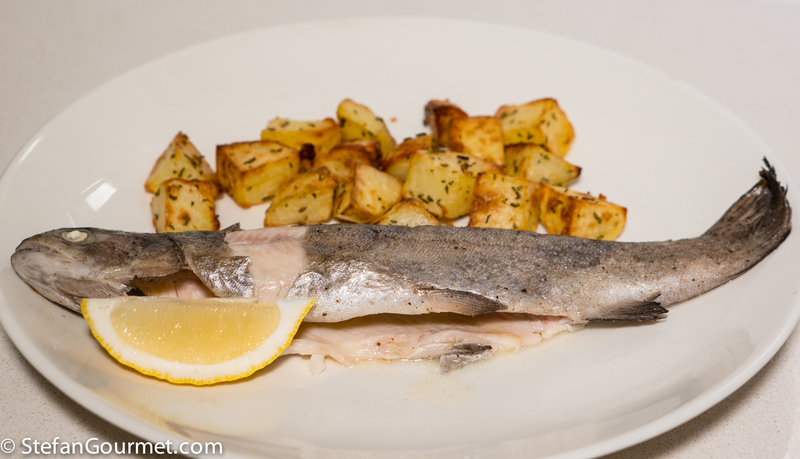 In this case a trout is wrapped in aluminum foil and baked in the oven, while potatoes are roasted in the same oven and with the same flavors (rosemary and garlic). The only tricky part is cooking the trout just right: too short and it will still be raw in the center, too long and it will be dry. I should have used a thermometer with a probe to prevent this conundrum, but I didn’t. If you are smarter than me, take out the trout when the center reaches 50C/122F. I’ve cut the potatoes smaller and roasted them at a higher oven temperature than usual, based on the recommendation of CampariGirl. 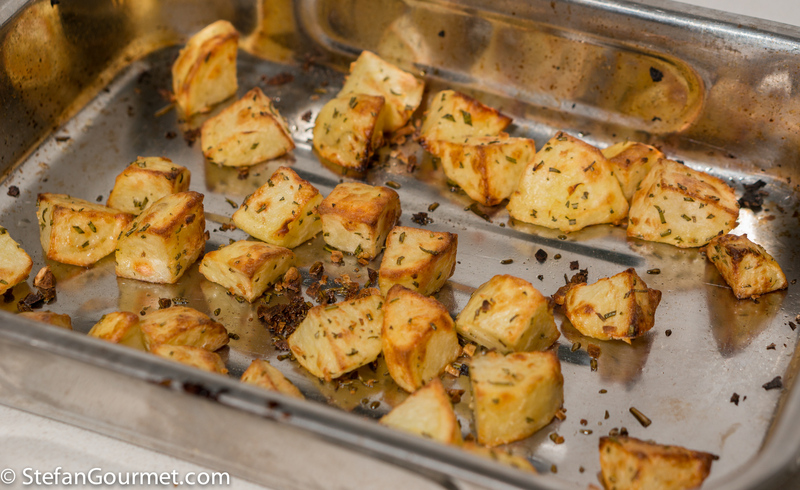 It worked very well, and if you like you could roast the potatoes even a bit longer to get them browned even more. Preheat the oven to 225C/440F (fan forced). 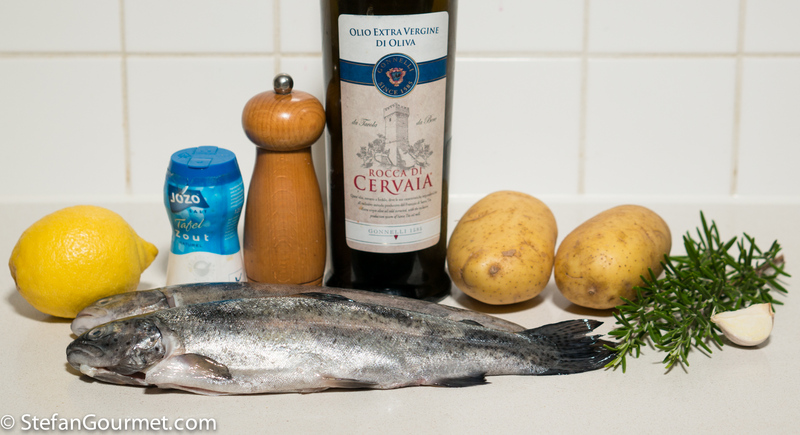 The potatoes need a bit longer than the trout, so start with them. 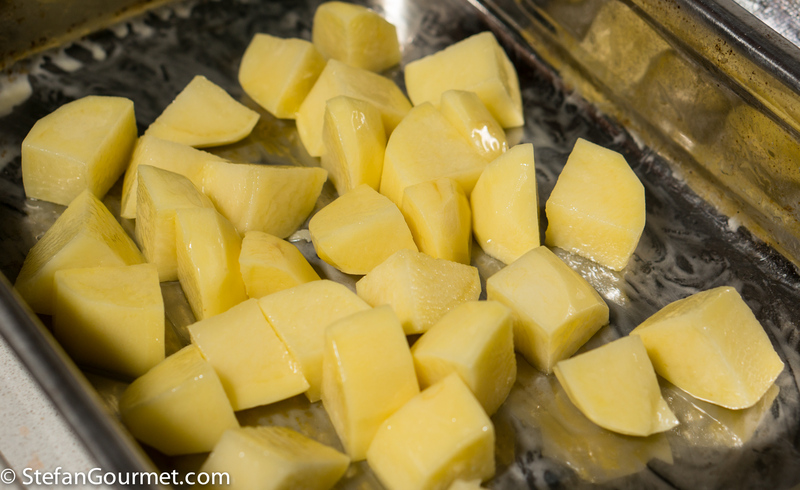 Peel the potatoes and cut them into pieces of about 2.5 cm (1 inch). Toss them with olive oil in an oven-proof dish. 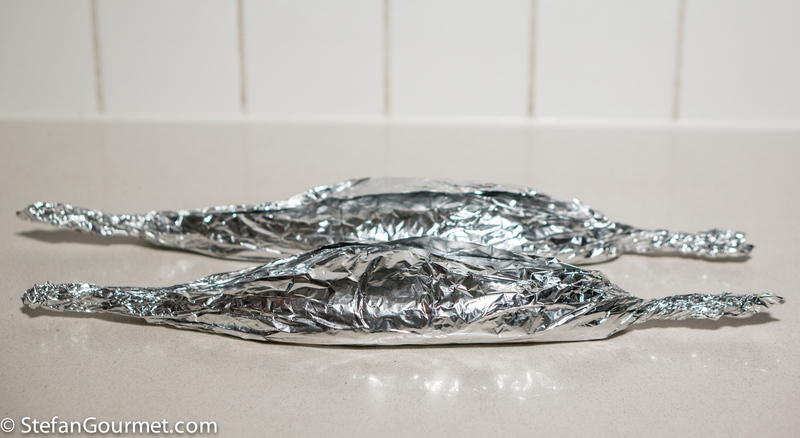 …roll up the foil, and close the ends to seal. 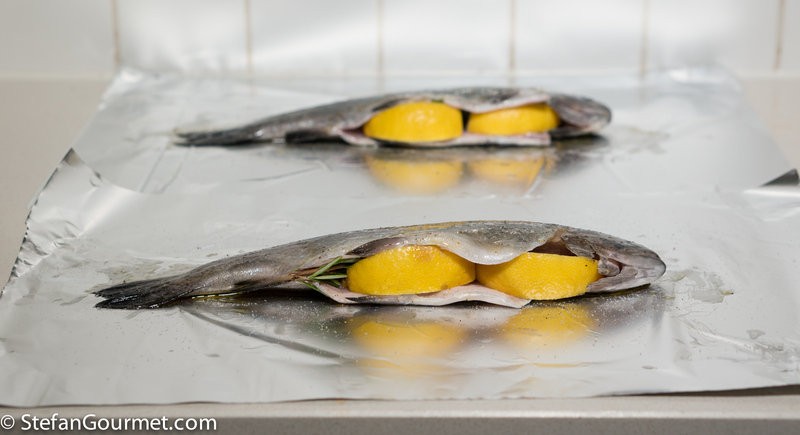 Make sure to rub the trout well with olive oil on the outside, so the foil won’t stick. Take out the potatoes after the first 10-15 minutes. They will be lightly cooked. 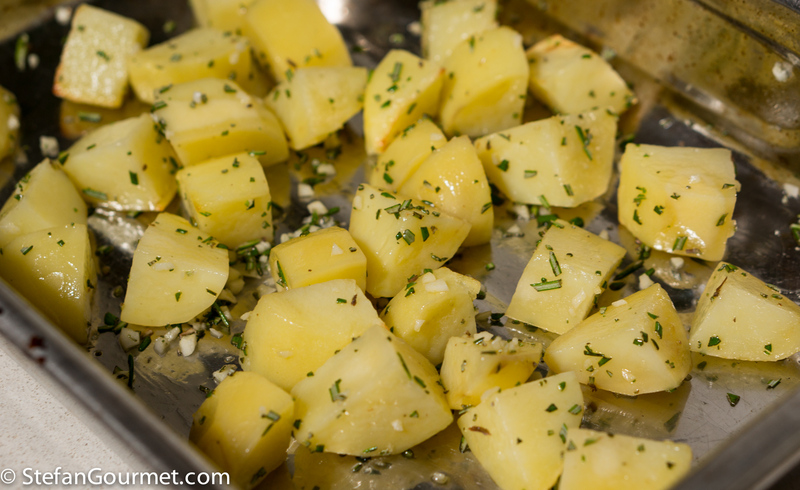 At this point, toss the potatoes with minced garlic and rosemary. I like to do this later rather than in the beginning, as I don’t want the garlic and rosemary to burn before the potatoes are done. 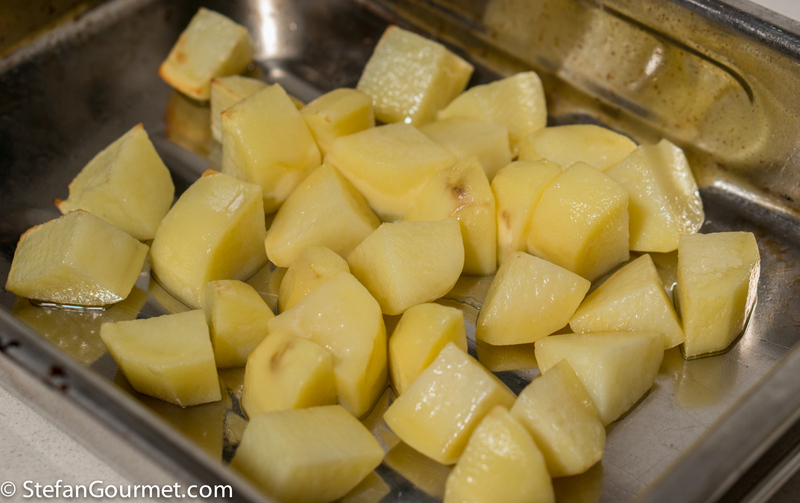 Continue roasting the potatoes until they are nicely browned (you could go a bit more than this if you prefer). In the meantime, bake the trout in the same oven for 15 to 20 minutes. As mentioned above, for best results use a thermometer with a probe and cook until the core reaches 50C/122F. 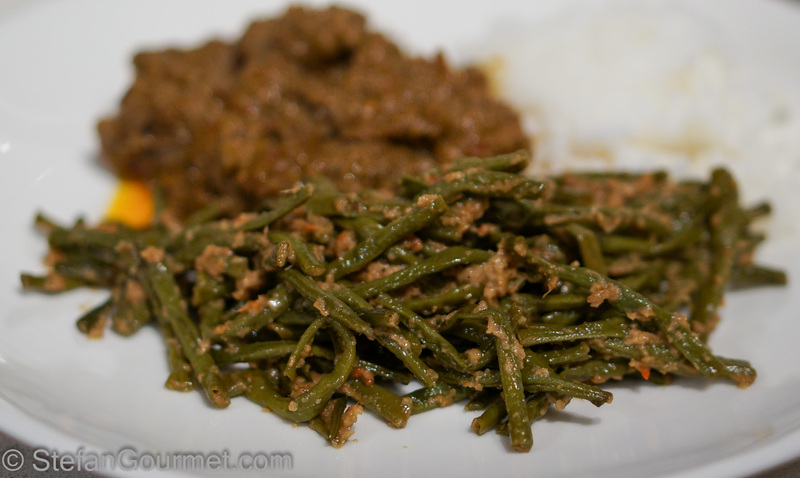 Indonesian food is very popular in the Netherlands, and one of the best known side dishes is spicy green beans. What a delicious and easy dish!! I love it!! Have you tried the Heston Blumenthal method for roasted potatoes, Stefan? They are amazing if you love the extra crispy outside fluffy inside style. Basically, just boil the chunks very well and dry them. Then roast them with plenty of olive oil in a hot oven. I have tried them when a friend made them and I think they have too much crust and too little ‘body’. I haven’t tried them at the Fat Duck though. I’ve never tried them at FD either. I use his recipe from Blumenthal at Home. They should be cut pretty think, into chunks. Either way, the do have a very crispy, glass-like exterior that some might not like in a roasted potato. I think the thickness (i.e. lack thereof) may have been the problem then. I do the same as Enassar but put them in a steam oven in stead of boiling for convenience sake. Floury potatoes, salted before steaming consistently deliver wonderful potatoes with lots of crispy skin. It does take 2 hours or so but with little effort. Eccole! Stanno arrivando. Cronaca di 300 trote annunciate! Per la cottura millimetrica di solito uso quella sottovuoto. Però la trota può sapere di fango, e cotta sottovuoto potrebbe aumentare questo sapore. Se hai un termometro e un sacchetto ‘zip’, potresti sicuramente provare. È facile, se vuoi ti spiego. Non ci vuole una macchina apposta? No, per pesce si può fare senza perché la cottura è così breve. Per un filetto di branzino o orata, 10 minuti a 50 gradi. Con un termometro, potresti mantenere la temperatura dell’acqua in una pentola sul gas a 50 gradi (tra 48 e 52) per 10 minuti, vero? Grazie ancora Stefan, sei davvero gentile. La prossima volta che vieni a Milano, chiamami! A perfect meal . . . Sometimes simple is the best with fresh trout. I was just recalling with a friend the time me and my husband caught six brook trout while fly-fishing near Banff, Canada. They were just delicious cooked in a cast iron skillet over the campfire with only butter, salt, and pepper and a squeeze of lemon. Great memories! Trout (or any fish) is supposed to be amazing when cooked within minutes after killing it. I’ve never had the pleasure yet. I hope you get to some day! I tend to either over cook or undercook fish when I make it in the oven. It’s tricky, never used a thermometer on fish before can you use on a filet or fish steak, I don’t cook whole fish, maybe thats a silly question. Love how simple and delicious this meal is. You can use it on any piece of meat or fish. The important thing is to put the tip of the probe in the right spot, which should be in the center of the thickest part, making sure it is not touching a bone (especially a big bone in meat) or ends up in a cavity. With a trout I’d insert it along the spine from the tail end. Only with very thin pieces there is no use, but usually better to pan fry those anyway. Great idea to postpone seasoning the potatoes with the rosemary and garlic until later in the roasting process, Stefan. I’ll definitely follow your lead the next time I roast them. As for the trout, I don’t have it often but, when I do, I’ve always pan sautéed it and never thought to put the thing in the oven. I’ll do that next time, too. Thanks!